Understanding the bull breeds isn't that complicated, yet there are people out there who wish to annihilate the existence of the bull breeds. In order to understand the bully breeds you must understand the LABELING that the BSL and HSUS has put on these dogs. They go by characteristics and not what their really a breed of. I think anyone with common sense could tell the difference between each individual dog. Look at that picture very carefully, and remember that this is what an American Pit Bull Terrier could look like in color, the Muzzle built and size will stay the same if it is a Pure-Bred. The American Pit Bull Terrier is a Medium size dog, short hair, muscular, with oval shaped eyes, short yet flat type muzzle. Their nose color comes in RED and BLACK. This is considered a Red Coated, Red Nose American Pit Bull. They come in Fawn, Blue, Black, Brindle and yes sometimes although rare solid white. Many people have no idea the true history of the American Pit bull, because of Wikipedia, Media and other sources of bad information. The truth is they come from the BULL-TERRIER, MASTIFF bloodline. The American Pit Bull Terrier and American Staffordshire Terrier do have similar bloodlines, however over the years their blood line has rather diminished from the original strains. 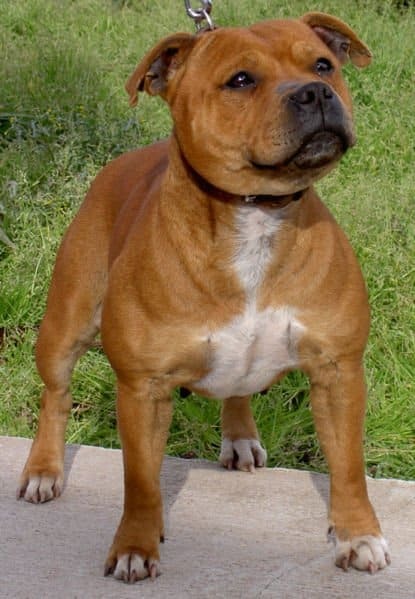 The American Staff and the Staffordshire Terriers should not be considered the same as the American Pit bull Terrier. The turning point of the Roman era, brought forth a need for dogs to clean out the rats of their empire, they developed a game which was called RATTING, which pitted owner and dog in the Arena Pit Area of a circular Colosseum like structure. Which had 4 openings with Metal like doors on them. In the center of this huge pit area was a hole filled with RATS, Dog and Owner would enter this hole. The breed of dog at this time was a Mollosser (gripping dog- small to medium size terrier) Which ever Owner and Dog killed the most rats won the round and moved on for more competitive games. This is where the Pit bull received the PIT in their name. More of the competition games consisted of Bull Baiting (Bull Fighting) Wild Boar Hunting and yes eventually Dog on Dog to being in wars. So no they were not originally bred to fight, more along the lines of exterminating rats and hunting. The Nanny Dog: Was not an American Pit bull terrier or an American Staffordshire Terrier, let's put that issue to rest right now. It is comments and statements as such that bring this breed to the misconceptions and demise. The Nanny Dog came to be as theory goes it is stemmed from a children's story "Peter Pan" and Vintage Pictures that have been found over the decades portraying them as such... Although those pictures were just of people enjoying the company of their family companion. The English Staffordshire Terrier (Staffordshire Terrier) is not to be confused with the American Staffordshire or American Pit bull. Yes all three have served in our wars, that can be used when advocating, however, the Nanny Dog statement should not be used at all. The Staffordshire Bull Terrier is smaller than the American Stafford and American Pit Bull. The Staffordshire Terrier should not be confused with the Am staff or American Pit bull. 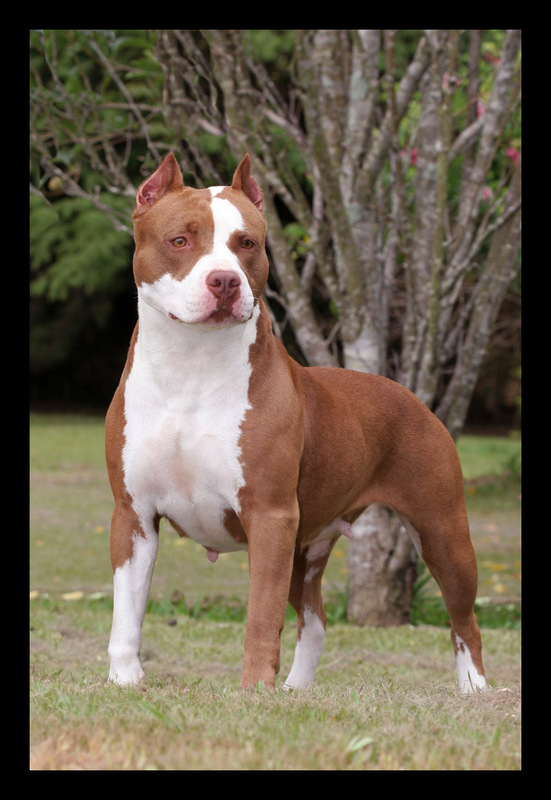 Although the AKC would have you believe that this dog comes in the exact same color variation as the American Pit bull and the American Staffordshire, they do not. Their colors are Solid Red, Black, red/white as shown above black/white Brown and or Brown/white, if they are pure bred. Mix breeds do come in brindle color and that is a cross with an american bull dog or pit bull. The pure bred weight is 30 - 55 lbs for male and females are usually 45 to 55 lbs. They are short, stocky build with a block like head and oval eyes. They are classified as a Terrier breed, because that is what they are, a TERRIER. They have the same history as the American Pit bull and American Stafford, because at one time they use to follow the same bloodline until the 1800's where they have Veered off into 3 separate strains. Bulldog, Bull Terrier, and Mastiff (Molloser). Remember what ever you find on the Internet cannot always be trusted, this is why I always tell people to look it up at the Local Libraries, Veterinarians or Trainers. Which I have done over the years of studying and researching this breed. Since Many Pit bull haters like to write their own descriptive view point which is not based on any fact, people become mislead into believing those stereotypical types and more so the HYPE that the BAD Media have portrayed about our beloved bully breed. Unfortunately with the way the Dog Fighting has been growing, they use these dogs for many of their fighting breeds along with baiting. However Am staffs, Stafford and the American Pit bull Terriers are not the only dogs they use for Fighting. Dobermans, German Shepherds, Rottweilers, American Bull dogs, and many more have been used in Dog Fighting, yet the common of the breeds used is the American Pit bull Terrier, American Staffordshire and yes even the smaller of the two, the Staffordshire Terrier. Does everyone see the difference of these dogs, I have shown? All three breeds are easily trainable, socializing is a bit of a challenge, yet with patience and perseverance the challenge can become easier, with help from a professional Dog Trainer or any Type of Dog expert- Veterinarian, Behavioral Specialist, and Trainer. As for understanding Dog Body Language, the bully breeds are the same as any other breed, although with the CROPPING of ears and tails it has become a bit difficult to some extent to tell the signs correctly. So you must go by the Eyes, Muzzle and Tongue with cropped animals, such as these breeds. Tongue Flicking- Constant licking and yawning is a sign of irritation and a warning to stop what you are doing that is irritating them. Muzzle- Mouth open with tongue hanging out means Happy, and yes means they are Hot too. Mouth closed and tense is a sign of irritation. Eyes- When eyes are soft it means they are happy, Partial white showing, is irritation, full white showing means anger (Whale Eye), followed with full on baring teeth and growling sounds. When dogs body is soft and loose and non tense, that is a sign of contempt and happiness. This applies to the Bully breeds, and all dog breeds... Once you get the hang of A dogs body language, you can prepare and teach your kids how to greet, act around your beloved dogs. All three dogs can be people and animal friendly if trained and socialized correctly. All three dogs can be dangerous if they are in the WRONG HANDS, and those are the ones who would seek to use them in Fighting. It's because of Dog Fighters that we have the viciousness of this breed, that many have worked so hard to Eugenically breed out of them, yet unlike other advocates I will admit that the Vicious gene is still there, dormant until these idiot Dog Fighters and Uneducated people get a hold of these dogs. Dog fighters abuse these dogs, and make them Dog aggressive, if these dogs become human aggressive they kill the dogs, or dump them on the streets or sell them to people without informing them of problems. Uneducated people, usually meaning those who do not ask questions about the breed and or do not take the time out to train/exercise/socialize their new dogs can lead to that dog being aggressive. Since there was lack of training, exercising (play) and Socializing. Now understand it is any breed of dog, not just the Bully breeds. Any breed can bite, any breed can become vicious, any breed can become what ever the OWNER chooses that breed to be. All breeds are an extension of their owner, whether you want to hear (see) this or not. Facts are Facts, and Truth will be said here. Pay attention to your dog's body, (eyes, mouth, tongue, tail, ears, body). Seek a trainer, or dog expert to help you understand your dog correctly. Experts are there for a reason, To help you understand and form a bond with your dog. Punish the Deed, Punish the bad owners. Don't punish the breed, keep them free from BSL, BAD MEDIA, And Dog Fighters. More about Dog Body Language and Dog Fighters will be coming up soon. Thank you for following and the continued support.